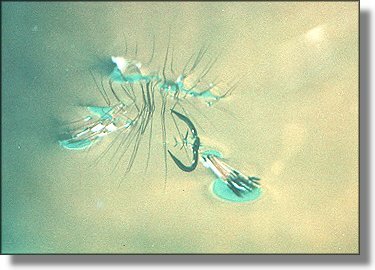 Fly Angler's OnLine "Flies Only - 5 - More Under Water Views"
Last week I presented a lot of information which was most probably new to you. It may be good to re-read section four now. With that, I will continue. You must realize the information you are getting in this was acquired over a period of months and at times years. Many pictures were taken, many thrown out for exposure or color problems. All exposure settings were done by calculation, all camera settings were on manual, and using a double set of extension tubes only allowed through the lens focusing. In short, everything was done the hard way. There would always be a delay of a few days for the processing of the pictures. Following that, re-calculations and another set of pictures taken. Next I tied a Royal Coachman shown here now. This fly is approximately the same size as the Adams in section four. 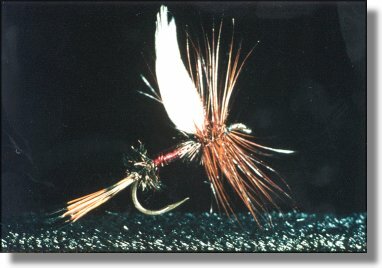 I tied it so as the hackle and tail would support the fly when at rest as the picture shows. Of course, the colors of the Royal Coachman are far removed from those of the Adams other than the choice of material for the tail. The next view of the Royal Coachman shows the fly at a position ahead of the window. Had the hackle not pierced the surface the fly would have only made indentations on the surface from the top side. As the high quality hackle did so, it can be safely assumed it would have also done so in a fishing situation. If not immediately, at least in short order. Once again, you can see the hook not only very visible due to the lack of anything else, but is also reflected. 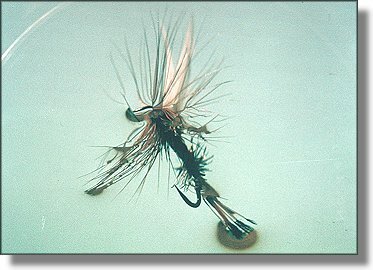 Once the hackle broke through the surface this allowed the hook to penetrate as well. Next we see the Royal Coachman on the edge of the window. At this point a fish would either commit or refuse. To wait any longer would be impractical. 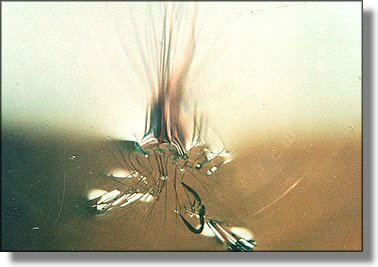 The fly in the above picture would coincide with the letter 'L' in the diagram shown earlier in this series. There is a section, on the very edge of the window, where the body is not visible, the hook can be seen and the wing is tipping into the window. Finally you have the fly as seen from beneath. Remember again, at this point the fish has little chance of accepting it. Next time some interesting comparisons and a new direction is taken.